On September 11, 1973, the democratically elected President of Chile, Salvador Allende, died during a US-backed coup d’état. 40 years on, Allende is of critical importance to those of the left, the poor and the underprivileged. On September 4, 1973, as the Chilean military prepared to overthrow Salvador Allende in a US-backed coup d’état, the country’s President remained defiant as he spoke to an unprecedented one-million-strong pro-Allende demonstration in Santiago. The demonstrators filed past La Moneda, the country’s Presidential Palace, and shouted “Allende, Allende, el pueblo te defiende” (“Allende, Allende, the people will defend you”). Following months of crippling strikes and an unsuccessful coup attempt in June of that year, the Chilean leader warned of those who “do not respect the majoritarian will of Chile”, and promised: “Let them know that I will not take a single step back! I will leave when I have carried out the people’s mandate! I have no alternative.” On the afternoon of September 11, as forces loyal to General Augusto Pinochet and the military junta surrounded the besieged Palace, Allende honoured the promise he made in his last radio broadcast to never resign to an unconstitutional government. By choosing to take his own life, he symbolically died as the freely elected President of Chile. Forty years after his death, Salvador Allende, the first democratically chosen Marxist leader in Latin America, remains a hero of the left, of the poor and of the underprivileged. A tenacious leader, he secured Chile’s top political post on his fourth attempt following his election in September 1970. Despite his Marxist credentials, Allende was quintessentially a Chilean nationalist who committed his life’s work to the betterment of his fellow countrymen and countrywomen, and to freedom from economic dependence or servitude to any outside power. As a close political confidant, Sergio Vuskovic, has testified: “He was not a Marxist in the classical literal sense, and frowned upon communist dogmas that emphasized a single party dominated ‘dictatorship of the proletariat’. What he did take from Marxism was a preoccupation with the workers and the poor, and the idea of equality. For these reasons, it would be more accurate to describe Allende as a libertarian socialist." He respected and enjoyed close ties with militant revolutionaries such as Cuba’s Fidel Castro but rejected the violent revolutionary approach for Chile and faithfully espoused social and political reforms within his country via democratic means. To this end, the Central Intelligence Agency engaged in massive clandestine operations, which had a hugely detrimental effect upon the country. The CIA concerned itself with the restriction of vital Chilean imports, exports, and assets, misinformation campaigns, funding opposition groups, manipulating the parliamentary process, and fomenting labour protests including a significant miners’ strike and a paralysing truck drivers’ strike in late 1972 (in a country with no extensive railway network). Most notoriously, Washington’s hand was shown in the kidnapping and ultimate murder of General Rene Schneider in October 1970, just a month after Allende’s election. Schneider was the commander-in-chief of the Chilean armed forces and was targeted for replacement due to his loyalty to his country’s constitution and his refusal to support the US-sponsored coup d’état strategy to topple Allende. By 1972, the collective effect of such interference was startling. From a figure of 977 strikes in the country in 1969, three years later the number had risen to an incredible 3287. By August 1973, inflation was at 320 per cent and the budget deficit was 115 per cent of the country’s receipts. 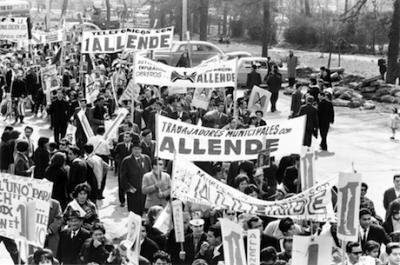 By early September, political and economic paralysis, and CIA-backed Machiavellian machinations influenced a weakening of Allende’s congressional support from earlier in the year. However, the million-strong march on September 4 at least indicated that he still enjoyed considerable grass-roots support and that he stood a respectable chance of holding out until his term ended in 1976. From Washington’s perspective, this ‘grim’ political reality compelled them to focus more exclusively on supporting the ‘Track II’ military coup option. The coup of September 11th 1973 was the endgame in Washington’s plans for Salvador Allende. Following his death, Chile was transformed from a civilian-ruled symbol of hope in the region since 1925 into a US-supported fascist dictatorship that ruthlessly crushed all political opposition and ruled the country with an iron fist until 1990. Over 3000 Chileans were killed or disappeared by the Pinochet regime and over 30,000 were imprisoned. In his last speech to the Chilean people just before his death, Allende placed the destruction of democracy in his country squarely at the door of the greedy within Chile and the forces of “foreign capital, and imperialism, who together with the reaction, created the climate in which the Armed Forces broke their tradition.” Forty years after his death, historical archives regarding the coup d’état reflect the accuracy of the late President’s words. Today the “great avenues” that Allende spoke of on his final day have indeed opened, and free Chileans can once again endeavour in his spirit to build a better society.